FileFinder is an add-in you can "drop-into" to any form in any Sesame application. Adding FileFinder to a form does not require any programming. It takes just a few minutes to add FileFinder to a form. FileFinder lets you access your computer's file system (right from the database record you're working on) to find a file, then gives you options for previewing the file and pasting its filepath into the record. File Finder lets you quickly link external files to your records or simply review those files while working in your database. How can you use FileFinder? FileFinder gives you instant access to your computer's file system (including mapped network drives) from inside the Sesame database record you're viewing. You can use FileFinder to find and display document files that may help with data entry or supply additional information needed to fill out a record or answer a question. You can find and link one or more files related to the record by having FileFinder paste in the full path to the file(s). How many databases or forms can I use FileFinder with? As many as you like. You can add FileFinder to any form in any database as long as you know which field you want to use for storing the filepath of the selected file. How long does it take to set up a FileFinder? About 10 minutes for someone familiar enough with Sesame Designer to add a button to a form and paste in the program. Can I get free technical support if I have any questions? Yes — toll-free at 800-780-5474 (US/Canada), 949-722-9127 outside the US. Or by email. A PDF (Acrobat) file of the FileFinder article that appears in the December 2006 issue of Inside Sesame, our monthly newsletter on Sesame. Read the FileFinder article now. A fully-functional FileFinder sample application you can play around with to familiarize yourself with how it works and find out what you might be able to use it for. To add FileFinder to your own application, simply place a Find File button on your form, copy the single program from the sample application, and paste it into the new button's programming slot. Done! FileFinder Pro — an advanced version of FileFinder —supports an optional includes file that restricts each user to just the drives and folder paths specified in their own FileFinder_includes.txt file. But it's more than just a restriction. It lets you provide users with plain English descriptions as file search starting points (instead of requiring them to navigate drives and folder paths). The descriptions work like shortcuts that take them directly to the folders containing the files they need to access. FileFinder Pro is $89 for the standalone (single computer) version and $249 for unlimited usage. A free, no obligation FileFinder demonstration is available over the Internet. You can use the sample FileFinder form to familiarize yourself with how FileFinder works. 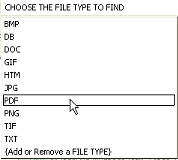 Choosing the File Type (file extension) to find. Choosing the drive to search. The list can include mapped network drives. You can optionally add folder locations (such as the My Folders shown) to quickly navigate to your favorite folders. The Folders flyout shows the folders on the selected drive. 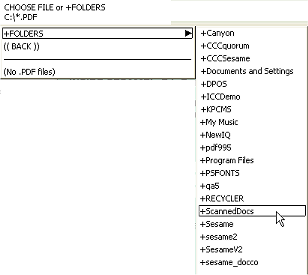 Here, the ScannedDocs folder is about to be selected, resulting in the list of found files shown in the next graphic below. Telling FileFinder what to do with the selected file.